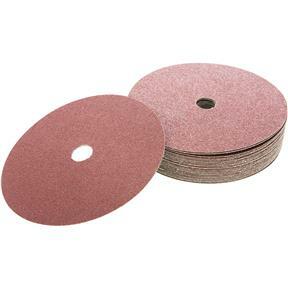 These Aluminum Oxide Resin Fiber Discs are a premium quality disc designed for long life, high stock removal, and cool cutting action on metal and welds. Sharp, heat-treated, and blue fired AO grain is electrostatically coated to a heavy-duty vulcanized fiber backing with heat resistant Phenolic resins to provide that fast, cool cutting performance. Please note that use of these discs requires the T27727 Back-Up Pad. 60 grit, 25 pack.